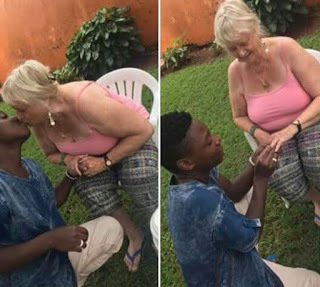 Monalisa Larson, a 70 year old Swedish grandma gets engaged to her 19 year old love, Aziz Mawanda, months after she dumped Ugandan Singer, Guvor Ace. Monalisa dumped the young singer last year after she claimed that he wanted to use her. The young lad proposed to Monalisa on Saturday, July 14th, in Kampala, the capital of Uganda.